Can you hear Etta James sing? I can! At last Loving a Lawman is on the bookstore shelves! This book was a long time coming and I’m so excited to be able to share it with you. Here’s a tiny peek at Loving a Lawman. to my new website and blog. I haven’t officially started this blog yet. But soon—real soon—I’ll be blogging about Texas, rodeos, small towns, my inspiration for this series, and cowboys. Lots and lots of cowboys. Here’s a picture to get you started. The photo credit goes to Smythe Richbourg. If you like this image you can see his other work on FLICKR. This shows one of the reasons I love cowboys so much! 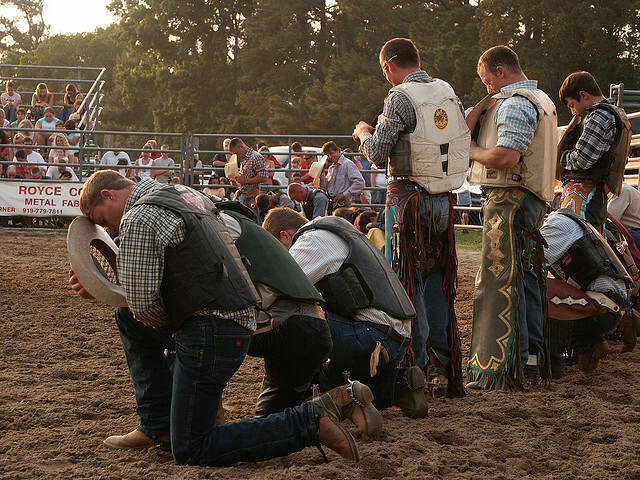 And if you feel like seeing a few more praying cowboys, check out this GALLERY. Feel free to sign up to receive updates. That way you’ll be the first to know when I start blogging! LINK to creative commons license. I have made no modifications to this photo.